J – The brisket came out pretty well, I have to say, all things considered. First, I clearly should have been more specific at the butchers. I’m pretty happy with the quality of the meat, but next time I’m gonna have to tell him exactly how I want it cut – this was a really nice, fatty, tender cut of brisket, but it was a bit thick and not flat, so it cooked somewhat unevenly. Second, we’ve been having some problems with our oven (as usual) being hotter than it says it is. I tested it in the morning with a thermometer and thought I had it adjusted right, but it still ended up more like 300F than 250F for the majority of the day. The brisket cooked about an hour – hour and a half faster than I thought it would, clocking in at just over 6 hours. The meat is still tender, still juicy, but not quite the fall-off-the-fork tender I was looking for. Luckily, our landlord has kindly offered to replace the oven – he understands the importance of a well-cooked brisket. Even with all that being said – this stuff is delicious, and plentiful: The dry rub has an intense smoky, spicy flavor – fair warning, if you don’t like heat, I would tone down or even take out the cayenne. It really comes through. Dry aging this overnight really brought some of that flavor inside the meat and tenderized the whole thing. Next time I make this I’ll double the liquid smoke and the beer and go a bit lighter on the dry rub. Given how much of this we have now, we’re going to be eating it all week. Given how tasty it is, that’s not a bad thing, either. 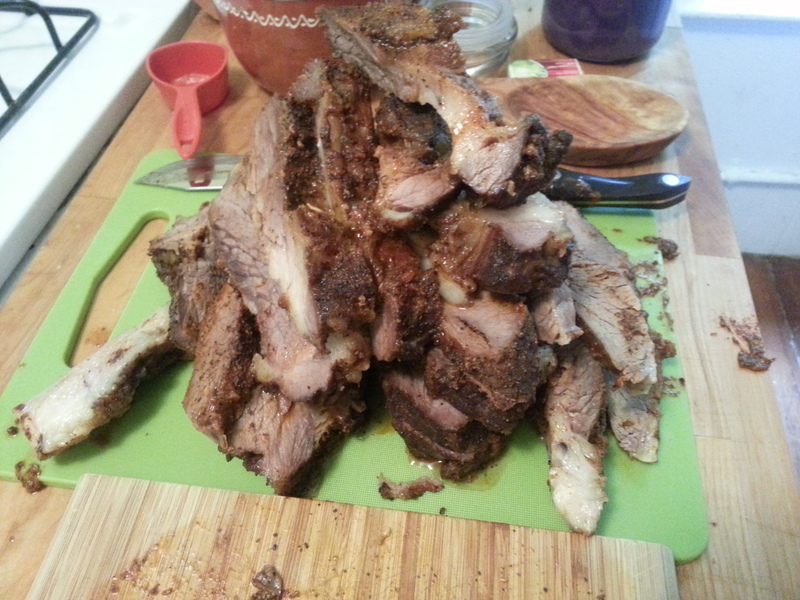 All in all, for my first time making brisket at home – I’m calling this one a success. Very good insight on Thanksgiving. I can remember well the pain of cramming desert on top of too much turkey and dressing. It hurt but we did what we had to do when the cake and pie came out. I can almost smell your brisket. Well done. Love your blog! I made Mimi’s chicken scratch cake this weekend to honor Mark’s leaving for Texas A&M Galveston. Looks like it was a good weekend to honor Mimi and Papa.